Jul 2, 2013 CAIRO // As protesters across the country demonstrated against Mohammed Morsi for a third straight day today, another Muslim Brotherhood figure was beginning to draw nearly as much attention as the president himself. 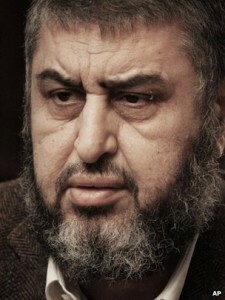 Khairat Al Shater, deputy leader of the Brotherhood and a major financier of the group, now regularly features on protest posters and in chants decrying what protesters describe as the Brotherhood’s secretive and conspiratorial ways. On Monday, a group of men including police officers fired guns at Mr Al Shater’s family home in the suburb of Nasr City and arrested his driver on charges of ‘assaulting a police officer’, according to Mr Al Shater’s son, Saad. Last Wednesday, protesters in the Nile Delta city of Mansoura looted three discount supermarkets of the Zad chain owned by Mr Al Shater’s family. Police refused to intervene, according to Saad Al Shater. Rarely appearing in media or granting interviews, Khairat Al Shater has built up a reputation of being a powerful back-room operator in the two and a half years since a popular uprising forced Mubarak to resign. Mr Al Shater was the Brotherhood’s presidential candidate a year ago but the electoral commission disqualified him because of a criminal record – the result of trumped up cases from the Mubarak regime – pushing Mr Morsi, a backup candidate, centre stage. Ever since, Mr Al Shater has been the quiet strategist pulling the strings of the presidency from behind the scenes, government critics say. When top diplomats visited Egypt, they sought Mr Al Shater’s perspective. Chief executives of global companies came to him to find out about the government’s economic direction. Mr. Al-Shater was the Egyptian Brotherhood’s first Presidential candidate before he was replaced by Mohamed Morsi and known to be the leading figure behind the Brotherhood’s “Nahda Project” that set forth the Brotherhood’s plan for the future of Egypt and the region more generally in the post-Mubarak era.